The Grab Bag is a bag of add-on parts for GoPro quick-release camera owners wanting more mounts. If you want to expand your mounting options for you Motorsports Hero Wide, Motorsports Hero, Helmet Hero Wide, Surf Hero, or Wide Hero camera... this bag will set you up. 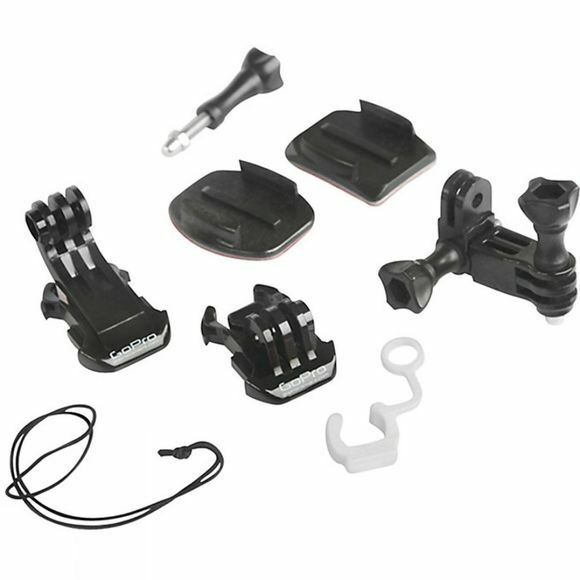 It includes a flat surface base plate, a curved base plate, a thumb knob and stainless steel hardware, a quick-release buckle, a pivot arm assembly, a quick-release vibration plug, a leash tether, and a vertical J mount for mounting your camera on a vertical wall surface like a car bumper, wall, back of helmet, or similar. Think it. See it. Do it. GoPro helps people capture and share their lives’ most meaningful experiences with others—to celebrate them together. Like how a day on the mountain with friends is more meaningful than one spent alone, the sharing of our collective experiences makes life more fun. GoPro’s versatile cameras allow people to show their passion and dreams through incredible photos and videos, therefore creating experiences and realities that expand our world and inspire those around us.